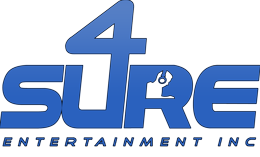 4 Sure Entertainment provides all aspects of entertainment for all types of parties. Weddings, Graduations, Sweet 16s, Birthdays, Back Yard Bash’s and Bar/Bat Mitzvahs… We are able to provide everything from the invitations to to goodie bags (give-a-ways)… Uplighting, Photo Booths, Party Motivators, Emcees, Name in Lights, Decor, Lounge Furniture, Montages, Photography, Videography, and All sorts of Event Planning. For information please contact anyone at 4Sure Entertainment by calling 847-691-2221. 4 Sure Entertainment specializes in DJ services from backyards to ballrooms. We can be Calm & Elegant or Spontaneous and Wild. Our philosophy and approach are simple: the event belongs to YOU. We allow you and your guests to ENJOY the party. We are dedicated to provide all of our clients with a unique event. Just like a snow flake, no one party should be exactly like another. We collaborate, celebrate, and create the perfect moment for your family, your friends and your guests. We know our passion for our work, mixed with our talent will make for an unforgettable event. Thats For Sure! We specialize in making memories. Your Mitzvah will have your guests leaving with shock and awe. We will make the wedding of your dreams a reality. We can help from the invitations to the thank you cards. Your guests will have a blast with live music and lighting from, 4 Sure entertainment.